On your walk from one restaurant to another your personal guide will entertain you with vivid tales and anecdotes. We start this tour with a glass of tuica (brandy) in Atrium Cafe. We discover the medieval town with its interior yards and forgotten corners. On the Liars Bridge we admire the beautiful view over the Upper and Down Town. Before arriving to the town’s symbol- the Council Tower, we taste a delightful cheese plate in the former inquisition room, now also known as Crama Sibiana. The tour continues on one of the narrowest streets in Sibiu and the oldest house, situated nearby. At Hermania we find out the use of this old building, that is now used by this Saxon restaurant. Here we will enjoy a Saxon tarragon broth and a Romanian beer. Crossing Piata Mare and Piata Schiller we reach the defense walls. 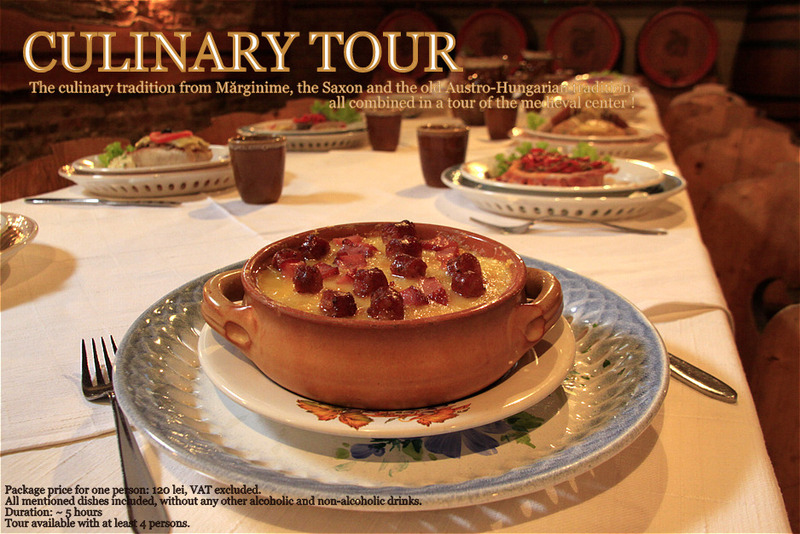 In one of the oldest wine cellars in Sibiu we will taste a Transylvanian tochitura (a traditional Romanian dish like a stew made with beef and chicken meats, eggs and tomato sauce) with polenta. For desert we head for Café Wien where we will enjoy a Viennese strudel and a coffee, thus discovering the old Austro-Hungarian tradition. Package price for one person: 120 lei, VAT excluded. Tour available with at least 4 persons.